Tigers are found in the wild in 13 countries across Asia and Russia, but their numbers have been declining very rapidly. There may have been 100,000 tigers at the beginning of the 20th century but only an estimated 3890 tigers are left in the wild. Our aim - double wild tigers population by 2022. The biggest threat to tigers is poaching for their body parts, mostly for their perceived medicinal value. Competition with loggers and agricultural land clearance means their habitat is a fraction of what it once was. WWF launched a major campaign to save the tigers and restore its population. Our aim is to double the number of wild tigers by 2022 and prevent extinction by working with governments and communities to protect their habitats and stamp out poaching and illegal trade. Field Diaries: Face to Face with A Tiger. 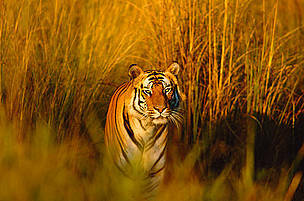 You would assume it is easier to get a glimpse of a tiger in a forest, but that is not where I saw my first wild tiger. I had just finished spending my last 5 days in Temenggor Forest Reserve, surveying the area and installing a few camera traps and there was nothing out of the ordinary. Yearning for my bed after a long few days, I was honestly not bothered when I saw something moving vigorously in the bushes across the road which was less than 5 metres from our car. It is common to see wild boars, or a herd of elephants if you are lucky. Another boar, I thought to myself. However, I looked to the bushes again and it seemed slightly orange. I reached for my camera just in case and at that exact moment, a tiger leaped out. The tiger was on the opposite side of the road just inches away from the car. Sensing the proximity of of the car, it took off in a different direction in a split second. Everything happened in a flash and I was awed by its facial expressions, the muscular limbs and its agility to dodge a fast approaching car. No amount of words can explain my encounter. Being able to witness its facial expressions and movements was truly an awe-inspiring experience. As field biologists, our main objective is to ensure that we are able to preserve such majestic animals. 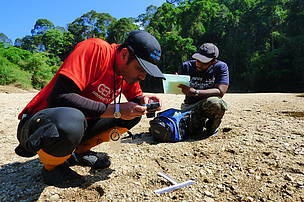 And your support towards WWF is enabling all our conservation work in the field. To be able to witness such a magnificent giant in the wild was with a truly memorable. And this encounter would forever be etched in my mind. 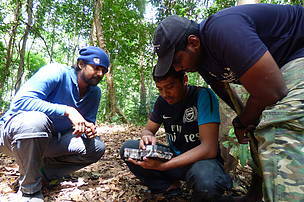 Learning to set a camera trap - a vital tool in wwf conservation.